I had planned on canning some apple pie filling this year, until I realized that freezing it is MUCH easier! I made these two bags up during Walker’s nap and the best part is there’s no cooking involved! *this recipe is for one bag of filling which will make one pie. 1. Place butter in freezer. 2. Mix all ingredients except apples, butter and lemon juice in a gallon freezer bag and shake until combined. 3. Peel and slice apples. 4. Coat apples in lemon juice. 5. Add apples and butter to sugar mixture and shake until combined. 6. Remove air from bag, label and freeze flat. When ready to bake, thaw and use as you would fresh apples. Mix all ingredients except apples, butter and lemon juice in a gallon freezer bag and shake until combined. Coat apples in lemon juice. Add apples and butter to sugar mixture. Shake until apples are well coated. Remove air from freezer bag, seal, label and freeze. 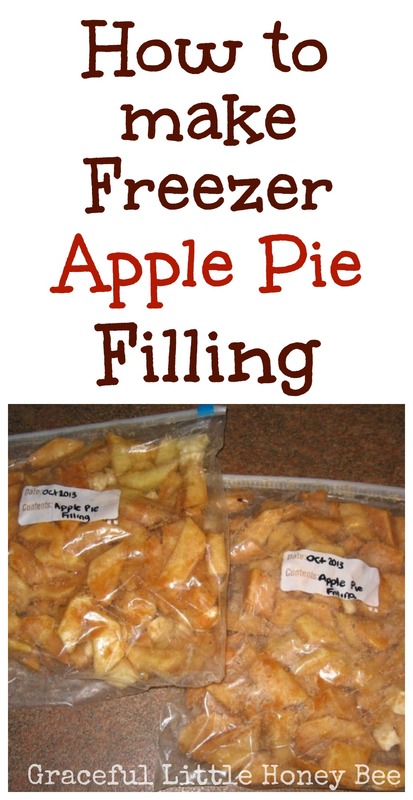 When ready to use, thaw and bake in pie crust like any other apple pie filling. Pie filling with last up to one year in a deep freezer. Do you want more easy freezer recipes? How many cups of sliced apples is this? My apples are huge! Do you use salted or unsalted butter for your pie filling recipes? Thanks! Thank you for this idea. I used your recipe 2 years in a row with our fresh Ohio apples- yum! The first year my filling was delicious and perfect. The next year it baked up so soupy they ruined the crust. I ended up scooping out what I could and serving it over ice cream. Still good, but not pie! Any thoughts on why this might have happened? I have already made 3 bags with this years apples so hopefully I'll be 2 for 3! What variety of apples did you use? One time that happened to me with an apple crisp, it was SO watery... but then I found out I had used apples that weren't good for baking. At what temperature do you bake the apple pie? You can bake at 350 for one hour.